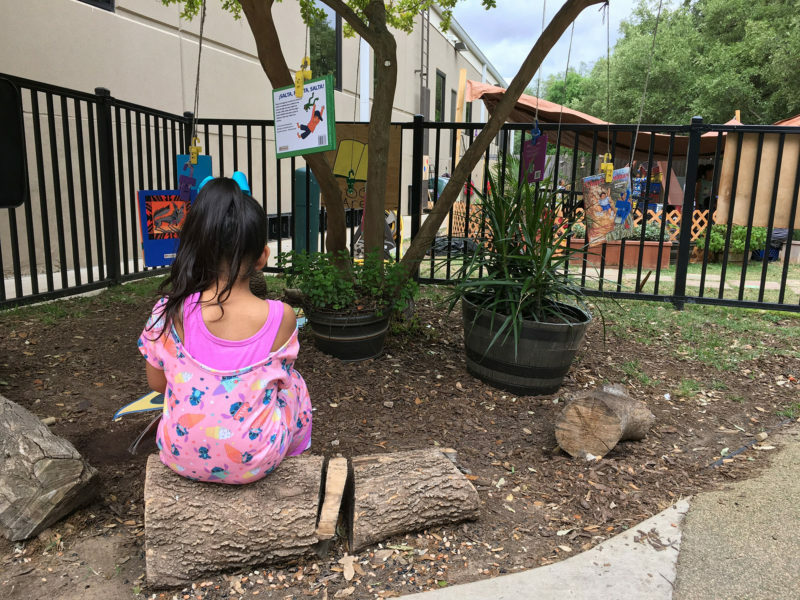 SAN ANTONIO, Texas — By the end of the school year, the playground at Pre-K 4 SA North Education Center looked like a dreamscape of “DIY Outdoor Learning Spaces.” The playground was divided into a series of yards, separated by gates, each with its own cozy reading nook and a music station equipped with unconventional instruments. Some yards featured kid-sized building materials. The playground is part of a deliberate approach to early learning designed by San Antonio’s city-funded pre-K initiative, Pre-K 4 SA. Since 2013, the program has served almost 8,000 students in its four education centers and awarded $8.5 million in grants to other pre-K centers and school districts around the city. Pre-K 4 SA uses a research-based curriculum called High Scope, which stresses a hands-on approach to developing memory, creativity, problem solving, and self-control. When they aren’t outside, children at the four Pre-K 4 SA centers spend their days in meticulously appointed classrooms. They grow food for their lunches in school gardens and they spend several weeks in an outdoor classroom, a covered porch with a full classroom underneath. The program’s CEO, Sarah Baray, says the approach makes a big difference. Baray, a former teacher and principal in the Austin schools, has also taught at Texas State University, where she conducted extensive research on educational leadership, community involvement, and school improvement. She said she sees clear evidence, as do others in her field, that developing those skills helps students persevere, work with others and think critically. Related: Finding a good preschool isn’t easy: Try it. Although Pre-K 4 SA does offer some transportation using specialized 15-passenger vans outfitted for 4-year-olds, Rishell drove 45 minutes across the city to take her son to the South Education Center after he was waitlisted at two other locations. “I don’t regret it at all,” she said. She even made additional trips regularly to volunteer. “There’s always something going on up there,” Rishell said. However, many Pre-K 4 SA graduates go on to attend chronically low performing schools, which makes it harder to sustain the benefits imparted at Pre-K 4 SA. That’s why the program was designed to offer professional development to kindergarten and elementary school teachers in San Antonio’s 19 public school districts. “We do know that what happens after they leave us matters,” Baray said. “If a child has high-quality K-3, they are almost indestructible academically,” she said. 67 percent of Pre-K 4 SA alumni in the San Antonio Independent School District passed the state’s third-grade reading test this year, compared to 62 percent district wide. Knowing that many students face such challenges during and after their time in Pre-K 4 SA, Baray is even more determined to give them a strong footing. The developmental delays associated with instability at home are one reason she stresses the need to have teachers who are highly-trained in early childhood. Pre-K is the first chance many students get to recover lost ground.